Where can I find the latest PC driver for my Razer Raiju Ultimate so I can play Non-Steam games? The Razer Raiju features plug and play support when playing games on Steam. For playing games on you PC outside of Steam please download the Raiju Ultimate driver here. My Razer Raiju Ultimate has stick drift issues, what should I do? My Razer Raiju Ultimate sometimes doesn’t register in Hair Trigger mode and has some input lag. We have a firmware updater available that can fix that issue for you! You will be required to download it to a Windows PC before you can use it to update your Razer Raiju Ultimate controller. Please click here to obtain the updater and complete installation instructions. IMPORTANT: Please note that drivers and updaters for Raiju Ultimate is intended for this specific version only and will not work with the older Raiju and Raiju Tournament Edition. Do I need the Raiju Mobile app in order to use the Razer Raiju Ultimate controller? Can I use a universal micro USB cable / charger to charge the Razer Raiju Ultimate? How can I disable/remove the multi-function buttons M1/M2/M3/M4 on the Razer Raiju Ultimate? How do I know the Razer Raiju Ultimate is charging? I don’t have another controller. What options do I have to be able to connect the Razer Raiju Ultimate to the PS4 over Bluetooth? If you do not have any of the above, you can still use the Razer Raiju Ultimate controller in USB mode. I cannot see the Razer Raiju Ultimate controller in the list of devices on the PS4 when I’m trying to pair. How long does it take to fully charge the Razer Raiju Ultimate? Is the Razer Raiju Ultimate Bluetooth 5 compatible? How many Razer Raiju Ultimates can I connect with my PS4? How do I remove a paired Razer Raiju Ultimate from Raiju app? My Razer Raiju Ultimate lags when it’s connected to the mobile app. What should I do? How many multi-function buttons does the Razer Raiju Ultimate controller have? There is no audio when my headset is connected to the 3.5mm audio jack on the Razer Raiju Ultimate. What should I do? Does the lighting on the Razer Raiju Ultimate effect sync up with my other Razer Chroma-enabled PC peripherals? No, the Chroma on Raiju Ultimate is designed especially for optimal console user experience. Therefore, it does not sync up with other Razer Chroma-enabled PC peripherals. Can I record macros on the Razer Raiju Ultimate? While you can remap any of the sixteen(16) buttons on the controller to the multi-function buttons, recording macros is not allowed on Razer Raiju Ultimate as it is designed specifically for tournament usage and complies with all tournament rules and regulations. How many D-Pad button layouts does the Razer Raiju Ultimate have? The Razer Raiju Ultimate comes with two(2) D-pad button layouts. A tilting and individual D-pad. How do I change the interchangeable D-pads and thumbsticks of the Razer Raiju Ultimate? How many thumbsticks does the Razer Raiju Ultimate have? The Razer Raiju Ultimate comes with two(2) extra thumbsticks (short convex and long concave). When pairing the Raiju Ultimate to the PS4, I get an error message saying that the passkey might not be correct. What should I do? What comes out of the box of the Razer Raiju Ultimate? Razer Raiju Ultimate Gaming Controller for PS4. I lost my D-pads, can I buy D-pads for my Razer Raiju Ultimate? I lost my analog sticks, can I buy analog sticks for my Razer Raiju Ultimate? What does the Razer Raiju Ultiamte Edition's Hair-Trigger Mode / Trigger Stops mean? What are Mecha-Tactile action buttons on the Razer Raiju Ultimate? How do I change the connectivity mode on the Razer Raiju Ultimate? How do I enable Hair Trigger mode on the Razer Raiju Ultimate. You can find the Hair-trigger mode switch on the bottom side of the Raiju between the two main triggers. 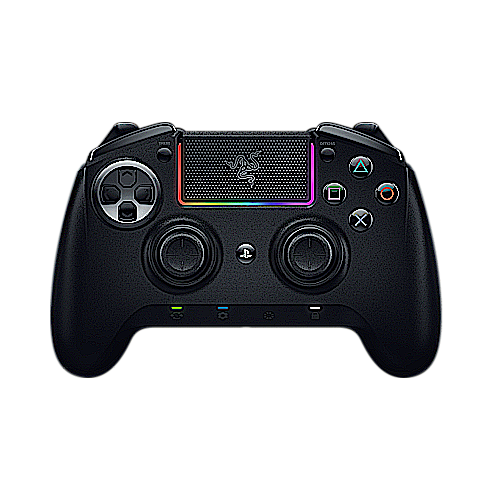 Is the Razer Raiju Ultimate supported by Razer Chroma? How do I control the Chroma lighting? Yes, the Raiju Ultimate is supported by Chroma. Please download the Mobile App "Raiju" from the App Store and use this App to control the lighting. You can also control the chroma lighting using the lighting button to cycle between lighting effects, and lighting button + D-pad left, right to change lighting effect, and lighting button +d-pad up/down to increase/decrease brightness. How many profiles can I save on the Razer Raiju Ultimate. The Raiju Ultimate's onboard memory can store 4 profiles and an additional 500 profiles in the cloud when you are signed in with your Razer ID. Where can I get the latest driver for my Raiju Ultimate controller? Can I clean the Razer Raiju Ultimate with alcohol-based solutions or other solvents? You should not clean the Razer Raiju Ultimate with alcohol-based solutions or other solvents. Doing so may tarnish the exterior surface of the controller. Can I use my Razer Raiju Ultimate on the PC? Your Razer Raiju Ultimate controller is fully compatible with any computer running Windows 7 and above. Can I use my Razer Raiju Ultimate on Steam as a PS4 controller? Yes, the Razer Raiju Ultimate controller is recognized as a PS4 controller by default on Steam. You just have to enable “PS4 configuration support” under Steam settings to use the Razer Raiju Ultimate controller on Steam. Can I use my Razer Raiju Ultimate on PC games outside of Steam? Yes, you can play most of the PC games outside of Steam with the Razer Raiju Ultimate controller by installing the XInput driver here. Please restart your computer if necessary after the installation. Find "Razer Raiju Ultimate" under "Human Interface Devices"